In 1858, Mary appeared several times to a young girl named Bernadette Soubirous near Lourdes, France. Mary called herself the Immaculate Conception, the title under which the United States had taken her as its patroness 12 years earlier. Bernadette was the only one who could see and hear the apparition, but even after being scolded by her mother, heckled by the crowds, questioned roughly by the authorities and even taken to jail, brave Bernadette never backed down. She did what Mary asked of her at all costs. Mary sent her to the local priests to ask that a church be built on the spot where she appeared. She told Bernadette to dig in the mud and drink from the spring she found there. People in the crowd mocked Bernadette and called her a pig, until miraculous healings began to happen to those who drank or bathed in the water. They say Our Lady taught Bernadette a prayer just for her and she prayed it every day for the rest of her life, never revealing it to anyone. Today, Lourdes is one of the most popular shrines in the world, as the healings both physical and spiritual are still happening regularly. 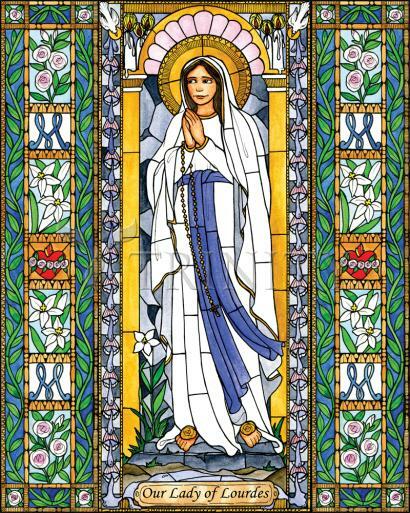 Many call on Our Lady of Lourdes to make them brave like Bernadette and she comes to their aid in accordance with God's will to bestow God's graces which he has granted for us. Mary told Bernadette that she did not promise to make her happy in this world, but in the next. Bernadette clung to these words all of her days, through the pain and suffering of bone cancer, keeping her eyes fixed on the Heaven Mary had promised her.